Gradually, step by step, our country proceeds further away from its painful past. We, its citizens, who are very close to the coalface of change may not easily see the steady transformation that informs all aspects of our national life. The past of which I speak is well known to all of us. It is a past of a racially divided country, of masters and servants, of racially inspired conflict and mistrust. It is a past of endemic and widespread poverty and gross imbalances in levels of development and the distribution of wealth, income and opportunity. It is a past of an economy that was immersed in a crisis that was destined to worsen. It is a past of the denial of freedom to the majority, gross violation of human rights and repression, of entrenched sexism, a past of high levels of crime, violence and corruption. It is a past of a South Africa isolated from the rest of Africa and the world, a pariah among the nations. It is away from this painful past that our country is progressing and must progress. Our first responsibility in this regard has been the need for us to recognise the reality that as a people we do indeed share this common legacy. Secondly, we had to make the determination that this was a legacy that we did not desire and were therefore committed to eradicate. I would like to take this opportunity to pay tribute to all our people, both black and white, who, in the past year and before, made a contribution, however small, towards the new advances of our country further away from its painful past. In my own contacts with our people I meet the constant refrain - what can I do to help build a better South Africa! These ordinary but truly heroic South Africans are not daunted by the difficulties they know we confront. They are not discouraged or overwhelmed by the litany of negative messages about our country to which all of us are exposed daily. They see no benefit for themselves or our country in highlighting the deficiencies of our society and minimising the achievements we have scored collectively. Indeed the difficulties that our country faces serve as an imperative to these fellow South Africans to persist along their chosen path of working even harder to build a new society. It is thanks to their common efforts that we can make bold to say that we have continued to move forward away from our painful past. To build on these constructive efforts, we call on all our people across the colour line to dedicate this year to building unity in action for change. Such unity in action among all South Africans should include joint efforts to implement the decisions taken at the National Conference on Racism. I wish once more to pledge that the Government will discharge its own responsibilities in this regard to assist our country to move away from its painful past of racism and sexism. Furthermore, we would like to reiterate our thanks to the Human Rights Commission for the holding of this successful conference. We call on all our people individually and collectively to join in this campaign themselves to become activists in the historic process to transform ours into a truly non-racial country. In this regard, I would like to congratulate Carl Niehaus, Mary Burton, Antjie Krog and others for their initiative to contribute to the socio-economic upliftment of their black fellow South Africans. There are others in our society who have also provided the lead and therefore also deserve a sincere word of appreciation. These include Afrikaner farmers and professionals and historically white schools who have voluntarily decided to devote time and resources to the development of the disadvantaged sections of our population. All of us are aware that later this year, we will be hosting the critically important UN Conference on Racism, Racial Discrimination, Xenophobia and Related Intolerance. The peoples of the world are approaching this Conference with the greatest seriousness and expect that it will result in important new initiatives in the global struggle to combat racism. As the host country and given our own experience of racism, we are expected to make a significant contribution to the success of the Conference. We will therefore have to take the necessary steps further to develop a national consensus on this matter and to demonstrate to the whole world the practical resolve of all our people to push back the frontiers of racism and xenophobia in our own country. During the past year, we also took important steps towards the further consolidation of our non-racial democracy. I refer in this instance to the demarcation process, the establishment of the new municipalities and the holding of the municipal elections. Through these processes, we have deracialised and strengthened local government as well as ensured the legitimacy of the new municipal councils, due to the fact that the elections were free and fair. All this puts the country as a whole in a strong position to make further advances in increasing the capacity of the people to participate in the process of determining their future. The requirements on the municipal councils to elaborate and adopt integrated development plans and to establish ward committees to facilitate regular communication between the councillors and the people are important instruments towards the realisation of the objective that the people shall govern. More work remains to be done to ensure the effective functioning of our new municipal councils. This will include the creation of effective management and administrative machineries in every municipality, the proper integration of the formerly different areas and the implementation of development programmes, including those focused on poverty alleviation. There are other outstanding matters such as the proper definition of the role of traditional authorities, the remuneration of the councillors and ironing out problems affecting the cross-border municipalities. All these are receiving urgent attention. Recognising the fact that we still have this outstanding work, nevertheless we would like to congratulate the Demarcation Board, the Independent Electoral Commission, the various organs of government, the political parties, the traditional leaders and our people as a whole, for combining their efforts to bring about the excellent progress we have made further to entrench our democratic system and enhance the capacity of government to contribute to the realisation of the goal of a better life for all. These important successes demonstrate practically what we can achieve if indeed, as a country and a people, we unite in action for change. During the past year, we also made new advances in what must continue as a sustained offensive against poverty and underdevelopment. By December 2000, the cumulative total for houses completed or under construction was 1, 129, 612 while subsidies allocated amounted to 1, 323, 205. During the year 2000, 397 019 electricity grid connections to homes were made. The cumulative figure for the supply of clean water provided through the Community Supply Programme has increased a hundred fold from 62, 249 in 1995 to 6, 495, 205 by November 2000. 412, 000 new telephone lines were installed in the financial year 1999 to 2000 and 127 clinics built in the year 2000. In the period from 1994 to November 2000, 917, 220 hectares of land was handed over to new black land owners through the government's redistribution and restitution processes. 37, 396 households benefited from the land redistribution process. Statistics South Africa also reported that, according to its October Household Survey released in July 2000, during the period 1996 to 1999, total employment increased from 9.3 million to 10.4 million, representing a net gain of 1.1 million jobs. It is also interesting to note that the Bureau of Market Research of UNISA reports in its categorisations that between 1995 and 2000, real personal disposable income of Indians increased annually by 2,8 per cent, the figure being 2,7 per cent for Africans, 2,1 per cent for Coloureds and 1,1 per cent for whites. Despite all these advances we are still faced with a daunting backlog of poverty and maldistribution of income and wealth as recently reported by the UNISA Bureau for Market Research. Reflecting the persistence of poverty among the Africans as well as disparities even at the high income levels, the BMR reports that more than 84 per cent of the low income accrued to Africans. 71,9 per cent of income earned by the high income group went to whites and 22 per cent to Africans. We must also continue to be concerned about the slow progress being made with regard to the important issue of achieving gender equality. Further disaggregation of the economic figures we have quoted would show that the most disadvantaged in our country are black women. The government itself has failed to achieve the necessary progress on gender equity even in the area of employment. The National Gender Audit carried out by the Office on the Status of Women shows that in September 2000, women constituted only 16 per cent of the complement of senior managers in government, despite the target set by the Department of Public Service and Administration of 30 per cent. On a more positive note, however, the figure for Gauteng Province was 37 per cent in 11 departments and 28 per cent in six departments in the Northern Cape. During the past year the economy also continued to improve in an impressive manner. A strong base has been created for an even better performance this year.
" The surplus of the financial account of the balance of payments exceeded by a considerable margin the absolute value of the deficit on the current account, raising the country's international reserve holdings to their highest level ever." * "the (further) development of housing infrastructure"
* "an acceleration in the growth in real output per worker in the formal non-agricultural sectors from a year-on-year rate of 2,4 per cent in the first quarter of 1999 to 6,5 per cent in the first and second quarters of 2000. The foreign trade surplus as at December 2000 was a record R9 billion. The consumer inflation rate was 5,3 per cent in the year 2000, compared to 15,3 per cent in 1991. Reflecting the truth of real increased business confidence, Nedcor's register of capital projects of more than R20 million showed an increase from R22 billion in 1999 to R48 billion last year. Furthermore, the current decline in yields on government bonds to record lows, while the share market is approaching its record highs, show that the financial markets have confidence in the government's fiscal policy, the monetary policy of the Reserve Bank and the ability of South African business and our citizens to deliver a better life for all. Our country jumped 14 places in the World Economic Forum's Global Competitiveness Report 2000, rising from 47 out of 49 countries surveyed in 1999 to 33 out of 59 in last year's report. The overall situation on our Continent also continued to improve, marked by such important events as the elections in Ghana and the smooth hand over of power by the defeated former ruling party, and the signing of the cease-fire and peace agreement by Ethiopia and Eritrea. Despite the difficult problems facing these two countries, steady progress is being made towards the resolution of the conflicts in Burundi and the Democratic Republic of Congo. As South Africans we should be proud to note that the past year has seen our country enhance its role as a reliable partner in the African and global struggle for democracy, peace, development and an equitable process of globalisation. Quite clearly, a better global setting will help us greatly as we pursue the national effort to secure a better life for all our people, which, in turn will give us better opportunities to discharge our own international responsibilities. A better Africa and a better world are in the genuine interest of South Africa's people. In further pursuit of the objective of a better life for all and building on what has already been achieved, the government has decided on a programme of action for the year 2001. I will now outline the principal elements of this programme of action, starting with the economy. As part of the process of planning for the future, towards the end of last year we had occasion to draw on the advice of some of the world's top economists and analysts from a wide range of schools of thought. There is a general consensus that we have established the necessary macro-economic balance and stability, away from the very precarious position we were in, in 1994, and despite a very volatile international environment. Furthermore, the international competitiveness of the economy has fundamentally improved. The threat of de-industrialisation and economic collapse as a result of manufacturing sector inefficiency which we inherited, has been addressed through tariff and industrial reforms. However the reality remains that our rate of growth is still too low as are the aggregate savings and investment rates. Similarly, the levels of poverty, unemployment and underdevelopment in some parts of our country are too high. While continuing to focus on the maintenance of the correct macro-economic balances, we have therefore decided to pay detailed attention to the critical micro-economic issues. In particular we have decided that this year the government itself, in all its spheres, and the public sector as a whole, must make a decisive and integrated contribution towards meeting the economic challenges the country faces. The objectives we seek to achieve are moving the economy onto a high-growth path, increasing its competitiveness and efficiency, raising employment levels and reducing poverty and persistent inequalities. To improve our competitiveness, we must lower input costs throughout the economy. Accordingly, we have decided to go over to a managed liberalisation of the energy, transport and telecommunications sectors. With regard to all these sectors, all outstanding policy matters, including the regulatory frameworks, will be addressed leading to the creation of the necessary climate of certainty for both public and private sector investors. With regard to the energy sector, among other things, our decision will entail restructuring the electricity supply and distribution industries to introduce greater levels of competition. Independent Power Producers will be allowed into our energy system and localised energy grids for rural areas will be developed. A Gas Bill will be tabled in parliament and gas from Mozambique, in the first instance, will provide a new energy source for industry and domestic consumers. In the transport sector, among other things, new investments will be made and restructuring effected in the rail, road and port infrastructure, including the new port at Ngqura or Coega. Ngqura/Coega will be the first Industrial Development Zone to be gazetted in March. More efficient port operations, including the granting of concessions, as well as competitive tariffs will be introduced. Steps will be taken to increase the number of flights to and from South Africa to assist with the promotion of tourism. A final decision will be taken on the King Shaka Airport in Durban. With regard to the telecommunications sector, we will go ahead with the public listing of Telkom which is part of our broad programme of the restructuring of state assets. The outstanding matter of the third cellular licence will be resolved in time. Further investments will be made in this sector. The application of modern communication and information technology in the fields of education, health, commerce and government will be expedited. As we have said, this year a greater degree of certainty will be reached with respect to the policy and regulatory regime of the telecommunications sector. Because of the critical importance of this sector, we will also establish two bodies to assist the government as it works further to ensure that we do not fall further behind the rest of the world as a result of the digital divide. The first of these will be a Presidential National Commission on Information Society and Development. This will be constituted from representatives of our country's public and private sectors. The second will be a Presidential International Task Force on Information Society and Development. CEOs from major international corporations and experts active in the field of information and communication technology will constitute this Task force. The members of the first of these bodies will be announced in the near future. I am also pleased to announce that the information technology companies that will be part of the Presidential Commission have already expressed their determination to work with the Government significantly to increase the numbers of skilled people in this sector. get onto and stay on the information super-highway. * Dr Henry Chasia of Telehouse Space Ltd.
* Mr Shuttleworth of Thwate Consulting of South Africa. We expect to receive some additional names in the near future. We have identified other sectors of our economy that require special attention because of their potential to contribute especially to the objectives of higher growth rates and job creation. These include agriculture, tourism, certain export sectors, cultural industries and the information and communication sector. The specific export sectors we are referring to are agro-processing, automobiles and components, mining technology and minerals beneficiation and clothing and textiles. In addition to lowering input costs and improving competitiveness, these sectors will be stimulated through specific policy and regulatory actions that will be effected this year. While not detracting from the state's ongoing efforts to maintain and sustain other sectors of the economy, different and additional actions will be taken this year to reinforce the growth of the sectors we have mentioned. We may perhaps mention some specifics relating to tourism to illustrate the kind of attention the government will give to the identified sectors. The Business Trust has already announced its decision to help create 3000 new black-owned tourism enterprises. This year, the Government and the Trust will fund 3000 learnerships in this sector. Major public sector investments have already been made in the Lubombo SDI and money will also be put into the Wild Coast SDI, including the rerouting and maintenance of the N2. Space has been and will be created for the private sector to invest in these and other SDIs, continuing our effort to build public-private-sector partnerships. New initiatives will be undertaken by National Parks in all the areas under its control to improve and increase the tourism infrastructure without damaging the eco-environment, bring in private sector investment, absorb larger numbers of tourists, increase job opportunities and other benefits especially to the surrounding communities, and preserve the national heritage, such as our rich collection of rock art. We will take further steps to encourage the opening of trans-frontier parks with our neighbours while continuing to focus on such other important issues as waste management, desertification, climate change, persistent organic pollutants and land management. Of course, we will also pay special attention to the preparations for the World Summit on Sustainable Development which we will host next year and which will bring an estimated 50 000 people to our country. We must also report that the public-private sector International Marketing Council has already begun its work. We are certain that it will assist greatly to build a positive image for our country based on a more accurate and objective understanding of the advances we are making and the better future we are building for ourselves. We have also taken the necessary decisions with regard to the improvement of the conditions that underpin and constitute the enabling framework for economic efficiency and competitiveness. I refer here to human resource development, technology, the economic infrastructure and access to capital. Honourable Members will agree that welcome progress is being made in the efforts to improve the quality of education, including the provision of infrastructure, consolidating the culture of learning and teaching, and introducing Adult Basic Education. However, much more needs to be done to improve our skills base. In this regard, Government has approved a Human Resource Development Strategy that will enable us to launch an accelerated skills development programme for those areas that are critical to a more competitive economy. Immigration laws and procedures will be reviewed urgently to enable us to attract skills into our country. Improvements in maths and science education will also be prioritised. We recognise the fact that competitiveness is driven by technological advances and innovation. In recognition of this, investment in research and development is one of the focal points of our integrated plan aimed at attaining a cutting edge in key areas such as biotechnology. At the same time, we will continue with the consultations aimed at reforming the labour market, as well as investigations into the feasibility of reducing the cost of labour without reducing workers' wages. Investment in the economic infrastructure will be prioritised to support the high-growth areas, the integrated rural development strategy and the urban renewal programme. An additional R6 billion has been set aside for this purpose over the next three years. The Government remains concerned that access to capital, which is key to economic growth and the development of the small and medium enterprise sector in the economy, remains difficult for the majority. We need to develop the capacity to make such access easier while retaining a well managed financial sector. Accordingly, the regulation of the financial services sector will be reviewed this year. New partnerships with financial institutions will be explored and the micro-finance sector will be mobilised in support of entrepreneurship and productive activities. The success of the integrated action plan we have just detailed will be measured by how it impacts positively on a number of key performance indicators including economic growth rates, employment levels, competitiveness, black economic empowerment and small business development. For us to achieve maximum results with regard to these economic initiatives will require not only the commitment and energetic involvement of the government but the building of a strong partnership with both business and labour. I therefore renew our appeal to our social partners to work together with us in a mutually beneficial partnership for change. On previous occasions we have reported that we were working on both an integrated rural development strategy as well as an urban renewal programme. In both instances our central aim is to conduct a sustained campaign against rural and urban poverty and underdevelopment, bringing in the resources of all three spheres of government in a co-ordinated manner. These programmes will, among other things, entail investment in the economic and social infrastructure, human resource development, enterprise development, the enhancement of the development capacity of local government, poverty alleviation and the strengthening of the criminal justice system. The new structure of local government, in urban and rural areas, will be the focal institution of government to ensure the co-ordinated implementation of our programmes, with the Ministry of Provincial and Local Government acting as the national co-ordinating ministry. Success in this work should have a positive impact on such areas as job creation, crime and violence, health and the general quality of life of millions of our people who lead desperate lives. matters of rural development and urban renewal. For example, investments totalling more than R3 billion have been made through the Consolidated Municipal Infrastructure Programme over the last three years, with 47 per cent spent in rural areas and 53 per cent in the urban areas. The work that will help us to move to a higher phase with regard to rural development has now been concluded. Unfortunately, I cannot say the same for the urban renewal programme except in the instance of two areas. * The Central Karoo District Municipality in the Western Cape. * The Qwaqwa District Municipality in the Free State. * Galeshewe in the Northern Cape. With regard to these areas, we will only be able to act immediately with regard to Alexandra Township and KwaMashu. Work is going on to bring in the other areas as soon as possible. Beginning from this year of the start of centenary celebrations in Alexandra Township, R1,3 billion spread over seven years will be set aside to embark on an integrated development programme that will deliver housing, roads, water, sanitation, schools, clinics, magistrate offices and police stations. Again I would like to emphasise that this does not mean that no work is being done in other areas. What we are addressing here is the elaboration and implementation of the urban renewal programme bringing together all three spheres of government. As we have already indicated, the success of these plans will also depend on the extent to which the people can be mobilised so that they become active participants in the processes targeted at the upliftment of their own communities. We therefore repeat the call that we must all unite in action for change. The social sector also has its own targeted programme of action focused on the social upliftment of especially the most disadvantaged in our society. It will implement co-ordinated programmes in the nodal rural and urban areas we have identified which, among other things, will address such issues as housing, water, sanitation, health including HIV/AIDS, pension pay-outs, household food security and nutrition, poverty alleviation including the provision of certain amounts of free services, Home Affairs services, education and training, sport and culture. Naturally, this does not mean that other areas of the country will be neglected. The sector will also focus on the complete transfer to their occupants of as many municipal houses as possible of the remaining 350 000 properties. Special attention will be paid to a more vigorous extension of the system of sanitation to contain the outbreak of water-borne diseases. In addition to the continuing campaign against AIDS, a more comprehensive approach to the health challenge in our country will be adopted to ensure an effective response to all infectious diseases, including malaria, tuberculosis, STDs, cholera, and hepatitis. Similarly, as already indicated in terms of some of the programmes we have already mentioned, we have to respond more decisively to other diseases of poverty such as those that are caused by vitamin, protein and energy deficiency. Work will be completed on a comprehensive social security system to try to extend the safety net to as many people as possible, bearing in mind the resource constraints we face and the need to ensure that we do not impact negatively on economic spending. We must again call on all our people to participate in the implementation of these programmes in the spirit of Masakhane. The Government will continue to pay the necessary attention to the issue of crime. We are very conscious of the fact that the safety and security of all our citizens is a fundamental right and a critical element in our continuing efforts to improve the quality of life of all our people. We want to arrive at the situation where all those who commit crime will know that they have nowhere to hide. As we have already indicated, the areas chosen as the lead points in our urban renewal programme will also be particular points of focus for our criminal justice system. The 124 priority police stations that we have identified in the past will also continue to receive the necessary attention and resources to enable them to do their work. In addition to other measures aimed at increasing the numbers of police personnel, the South African Police Service will give all required assistance to the Metropolitan Councils to enable them to establish their municipal police services where these do not exist. The National Directorate of Public Prosecutions and our courts will also continue with the measures they have already adopted to reduce and eliminate the unduly large backlog of cases that have not been tried. Similarly, work will continue to find a solution to the problem of overcrowding in our prisons caused especially by the large numbers of awaiting-trial prisoners. The criminal justice system will also further intensify its offensive against corruption among its own personnel. This will include the introduction of a new leadership at Correctional Services, an increase in intelligence resources dedicated to the fight against corruption and, where necessary, the expansion of the existing anti-corruption units. Last July, the Minister of Safety and Security placed a moratorium on the use within the Police Service and the release of crime statistics. This was because of serious problems about the integrity and reliability of these statistics which, among other things, made it very difficult to design accurate and optimal operational plans in the fight against crime. The point needs to be understood that perhaps more than anybody else, the Ministry and the Police Service constantly need accurate and up-to-date information on the incidence of crime to ensure proper deployment of human and material resources. specialise on the issue of crime information. At this moment, it is expected that the moratorium will end at the end of June. The criminal justice cluster will also intensify its efforts to encourage further community involvement in the fight against crime and corruption. This will include the recruitment of 30 000 reservists especially in the already identified high-crime areas. Once more, this emphasises the importance of popular involvement in the common effort to change our country for the better. The challenge of ensuring the effectiveness and efficiency of the structures of government extends beyond the criminal justice system. It affects the entirety of government. The strengthening of the system of local government is one of the priorities the government has set itself. We are also focusing on the improvement of the quality of service delivery and efficiency in the use of public resources in all areas of Government, among other things to overcome the problem of under spending which continues to plague us. The gradual introduction of e-government will assist us greatly to overcome these problems. The sustained implementation of the government's human resource development programme to improve management and other skills as well as to enhance respect and observance of the principle of Batho Pele is also of critical importance to the achievement of our objectives. We will soon convene a strategy meeting to assess progress and problems with regard to the fight against corruption, in particular, to ensure the implementation of decisions reached in the Summit held about two years back. We will continue to take all necessary steps to limit this unacceptable practice. This will include thorough audits of some of the outgoing municipal councils after which decisive action will be taken against those found to have abused their positions for corrupt purposes. As Parliament and the country are aware, a successful Public Service Job Summit was held at the end of last month. I would like to quote some excerpts from the Preamble of the Framework Agreement arrived at, to show the commitment of the Government and the public sector unions to serve the people of South Africa.
" The parties to the Public Service Job Summit meet at a time in the history of our country when the challenge of managing a transformation process in the public service is upon each of us. It is a time when the parties face the twin challenge of transforming the public service to improve the reach, depth, efficiency and quality of social service delivery, whilst at the same time improving the conditions of service, quality and sustainability of jobs for employees of the public service.
" 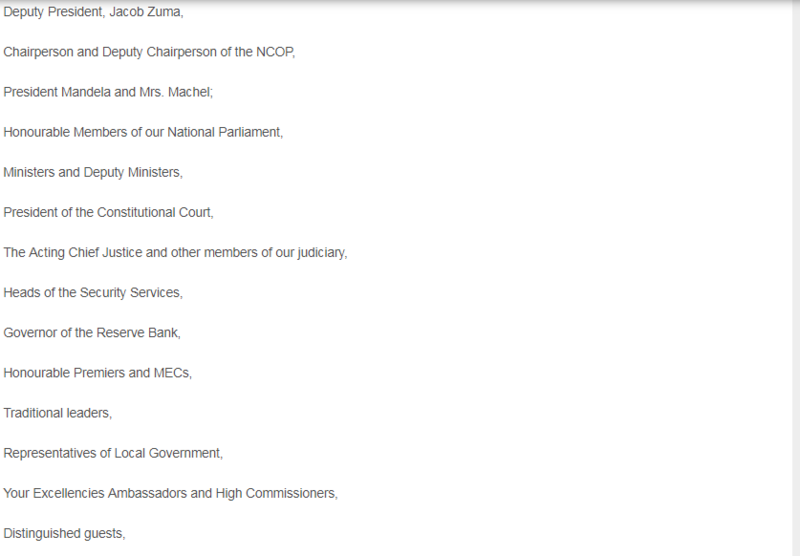 The parties acknowledge that they share a common commitment to a broader interest of serving the South African nation. Accordingly the parties record their commitment to respect in words and deeds one another, and to live by the spirit and letter of this agreement which shall govern the objectives, principles and procedures for the management of the transformation process." The Government applauds these sentiments and commits itself to honour the agreement it has entered into. Furthermore, we salute these freely agreed positions because they contain the important lesson for all of us that we need to unite in action to bring about the changes our country requires. I am very pleased that we have among us the former Minister of Intelligence, the Hon Joe Nhlanhla, a principled and loyal patriot. The cruel misfortune of ill-health brought about by pressures of work has deprived all of us of his dedicated service. I am certain that you all join me in wishing him the speediest recovery possible so that we could, once again, draw on his considerable talents. We have entered the 21st century having resolved and declared to ourselves, as Africans, and to the rest of the world that, primarily, none but ourselves can extricate us and our Continent from the curse of poverty, underdevelopment and marginalisation. The majority of people present in this Chamber are South African. Outwardly we are a people of many colours, races, cultures, languages and ancient origins. Yet we are tied to one another by a million visible and invisible threads. We share a common destiny from which none of us can escape because together we are human, we are South African, we are African. We have worked together for a decade to make of our country what for 300 years it was not. As a country, undoubtedly all of us will have made mistakes as we sought to build what had never been there, and will make yet more mistakes. But we were right and did not make a mistake when we agreed together that we will transform this common troubled motherland and set about the task of transforming it into a country of democracy, peace, equality and prosperity. Many on our Continent and elsewhere in the world were pleased to count this infant South Africa as one of the jewels on the African crown. As these Africans of many races and colours we will and must work with the rest of our Continent and our partners across the globe to give life to a new Millennium African Recovery Programme. Together, we must turn into reality a new internationalism that does not permit of the coexistence within human society of opulence and grinding poverty, of a thriving modernity and a dehumanising underdevelopment. The burden of our prayer to you today has been that all of us must hold firm to the correct course we have chosen and hold firm to our resolve to walk that road together. Ahead of us is a new century and a new millennium. We march into the new era of the African Century as Africans who have made the determination that this century will be a hundred years in which we cease to be victims of our circumstances but become victors. By what we do, we will ensure that wars, disease and underdevelopment are no longer seen as being synonymous with Africans. Through our own actions we will ensure that poverty gives way to prosperity. As we strengthen the bonds of friendship and solidarity with our fellow Africans we have an obligation to help ensure that, in our country and everywhere else on our Continent, no African child should ever again walk in fear of guns, tyrants and abuse; that no African child should ever again experience hunger, avoidable disease and ignorance; that no African child should ever again feel ashamed to be an African. Our Government, democratically elected by the people of South Africa, will do its best to live up to these injunctions. We know it as a matter of fact that all men and women of conscience at home and everywhere else on our common planet will, themselves, take no other road but this one, for which many across the oceans describe ours as a land of hope.